March 3 is World Wildlife Day, and we just had World Pangolin Day. So we have created a tribute to this fascinating and funky animal – the pangolin. Download the song “The Pangolin.” We also call this song “He’s So Funky.” Listen to the song and see why. You: He’s so funky. He’s so funky. Students: Who’s so funky? Who’s so funky? Everybody: The pangolin. The pangolin. He’s so funky. He’s so funky. Who’s so funky? Who’s so funky? Baby rides on Mama’s tale. And ants. He loves ants. The pangolin. He’s so funky. The pangolin is a funky mammal with a long tail and a long tongue. The tongue is about as long as his whole body. This allows him to slurp up ants and termites by the hundred. The pangolin is a mammal, but he’s covered in scales. The scales are made up of keratin—the same thing that your hair, your fingernails, or the horn of a rhino are made up of. 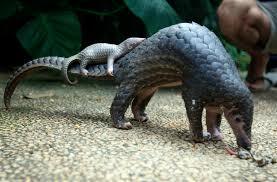 Baby pangolins ride on their moms’ tails. February 21st is in fact World Pangolin Day. And it’s important to know who the pangolin is. If we don’t there’s little chance this funky animal will survive. That’s because the pangolin is caught and trafficked, mostly to China and Vietnam, where it is eaten as a delicacy or used in traditional medicine. Help the Pangolin. For more ideas, download The Pangolin Activity Manual. Thanks a a lot for creating and setting such great tool… English is my second language but with everything found here, I’m really going to learn many things. Thanks a a lot for creating and setting such great tool… English is my second language but with everything found here, I’m really going to learn many.